A cultivar of Camellia japonica L. Camden Park bred, 1/50. ‘Light flesh colour, with a few splashes of crimson and pink. Three rows of outer petals, large, thick and well formed; inner petals more rounded and twisted. Moderate size. Very handsome.’ William Macarthur. [MP A2948-6]. Raised at Camden Park and named in 1850. The plant now widely sold in Australia under the name ‘Aspasia Macarthur’ should perhaps be considered an ‘improved’ form. We know of three ‘Aspasia’ trees in Australia in excess of 100 years old that bear flowers subtly different from younger trees. The flowers are smaller, have a ground colour closer to the ‘light flesh’ described by William Macarthur, rather than the creamy-white of more recent plants, and fewer splashes of crimson and pink. ‘Aspasia’ is marked with a ‘C’, probably shorthand for ‘Camden’, in Macarthur’s handwriting in a Camden Park copy of the 1850 catalogue, together with ‘Circe’. These are the first two Camden-raised cultivars to appear in the published catalogues. Listed in the 1850 and 1857 catalogues [T.200/1850]. It was also listed in the ABHSR of 1849/50, although without the asterisk that denoted ‘New Seedlings raised at Camden’, presumably an oversight. 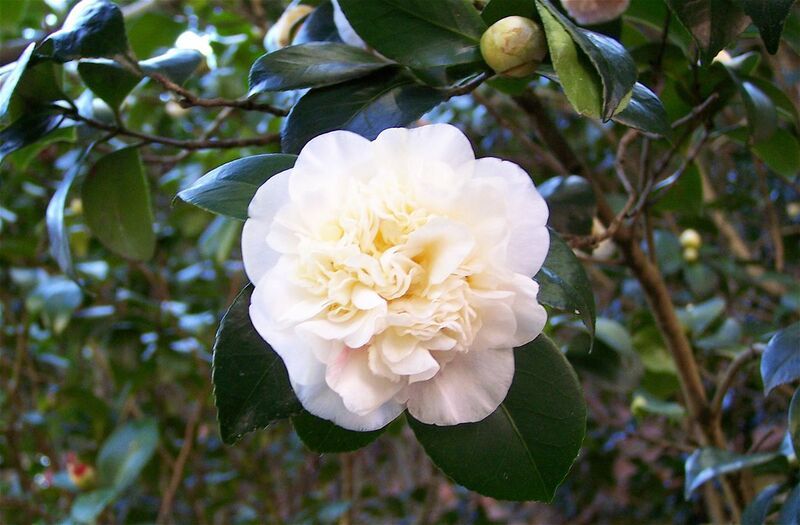 This beautiful Camellia is still freely available in Australia under the name of ‘Aspasia Macarthur’. A name change became necessary to avoid confusion with an Italian cultivar apparently bred some 3 years after the Camden Park plant first appeared, but given precedence because it was described by Verschaffelt in 1853, before a description of Macarthur’s plant appeared in print. Waterhouse proposed the name ‘Aspasia (Macarthur, 1850)’ to overcome this difficulty. [CQ]. This has inevitably become corrupted to the very misleading ‘Aspasia Macarthur’, with most people no doubt believing it to be named for a member of the family. ‘Macarthur’s Aspasia’ would be a preferable alternative and there are plenty of precedents for such a name. Camellia japonica ‘Aspasia’ |Old Camden High School camellia #11 | Photograph Colin Mills, 2007 | This was grown in the 1960s from a plant at Camden Park which has since died.